No more frustration of your wheelie bin going walkabout on collection day ever again!. With our popular wheelie bin stickers, you can personalise your bin to be both attractive and instantly recognisable. All our stickers are made in the UK, with self adhesive single colour exterior vinyl. Associated size is ideal for smaller bins and kerbside containers. Waterproof and weatherproof, quick and easy to install. 100% made in the UK to order (by making your design to order ensures perfect spacing of characters, No individual numbers to align!). 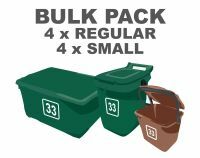 Available in a range of styles and colours (choose a vinyl colour carefully that will contrast with your bin, a green bin is shown in the main picture with white vinyl, green vinyl on a green bin would not show up very well!). 95% of all labels we supply are WHITE because it provides good contrast with nearly all bin colours. 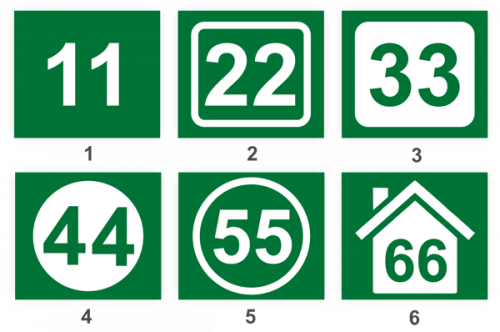 We can also supply numbers with street names (refer to our other product listings). © wheelierubbishsigns.co.uk - All rights reserved.